Want to fly to your desired domestic destination via PAL? Here are new Philippine Airlines promos as low as P999 base fare. 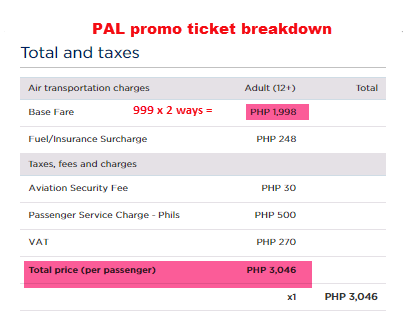 The new PAL promo tickets are good for one-way base fare to domestic destinations from Manila, Cebu or Clark. Grab the chance to book affordable fares for trips on the next 2 months. 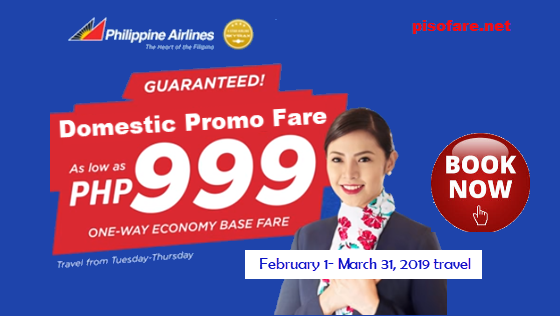 Philippine Airlines sale tickets are base fare promos and do not include Admin Fee, Fuel Surcharge/Insurance, taxes/fees and Passenger Service Fee (Domestic Terminal Fee). Book sale ticket online at www.philippineairlines.com. Purchase the low fares at PAL ticket and sales offices. Call the Philippine Airlines Reservation Hotline numbers. PAL promo fares are non-refundable but re-bookable for a fee of Php2,500 including 12% VAT. There is no child, senior citizen, student, PWD or military discount on this seat sale. Sale ticket cover 7 kilos hand carry baggage but no check baggage allowance for Economy promo ticket. Get the latest promo fares and seat sale in your newsfeed! Like and Follow us in Facebook: PISO FARE TICKET!! !